In the upper left corner of each card is a pair of short parallel lines which form a track leading to the alphabet letter represented in braille. At the center of each card is a clear tactile illustration of an item that begins with that letter of the alphabet. In the lower right corner the represented letter is depicted in a raised uppercase print format. 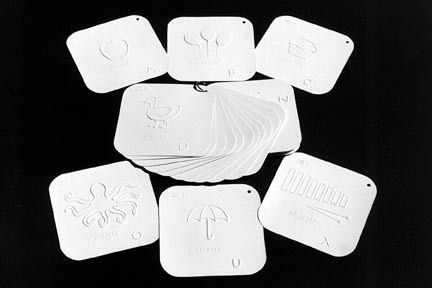 Packet contains 26 7"x7" white plastic cards, fastened by a removable ring, and a braille alphabet guide. To order any of our products by phone, please call us at (516) 466-9143.